Michael Smith on his Northern Ireland debut. 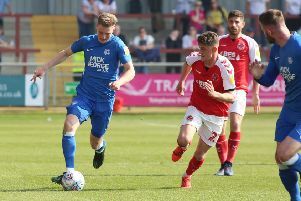 Peterborough United full-back Michael Smith has missed out on a place in Northern Ireland’s squad for the 2016 Euros in France this summer. The writing was on the wall for the 27-year-old right-back when he didn’t feature in last night’s (May 27) 3-0 friendly win over Belarus. Former Posh striker Conor Washington scored in that game and has made the Euros squad. Smith made his Northern Ireland debut against Slovenia in March, but was one of five players axed when Michael O’Neill reduced his squad to 23 players today (May 28).